The best way to get to know a community is by scheduling a tour. See the facilities, meet the staff and residents, and get a feel first hand what it's like to live at Regency Retirement Residence of Clinton Independent Living. One of Clinton’s best kept secrets nestled on the east of “The Alverno” is a senior living community that provides an intimate setting is Regency Retirement Residence of Clinton. Our community has remarkable ranch style interiors and composed of twenty eight residences. Residents of our community has access to rich amenities and a loving place they can call home. 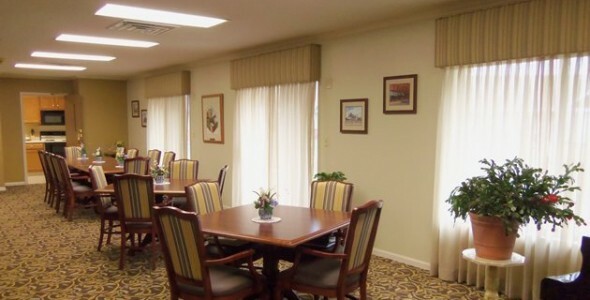 The Regency Retirement Residence of Clinton is an independent living community designed for people 55+. Sponsored by "The Alverno", the Regency is a not-for-profit with resident participation on the Board. Our community provides rich amenities that are enriching to the wellness of our residents. Our grandiose dining area is where residents eat together heartily as they listen to the beautiful music played on the baby grand piano. You could read a good book from our library on our nostalgic fireplace or walk as you relax on our stunning courtyard. We have different floor plan options you can choose from, we have one bedroom and two bedroom apartments with own kitchen, living room, bathroom and patio with a great view of our garden. For the safety of our residents we have entry security system and emergency call system to ensure that they could get help when they need it easily. Our community has 24 hour on-site staff that could provide assistance to our residents to their needs. We have transportation services that is complimentary and can take you to shopping, medical appointment or outings. We have created a lot of activities that promotes wellness and keeps our residents active. Here at Regency Retirement Residence of Clinton residence enjoys the luxury of a home without the chores that comes with it. We will take of your housekeeping, laundry and maintenance. Keep connected to your friends and families through digital communication using our Wi-Fi connectivity through Regency.